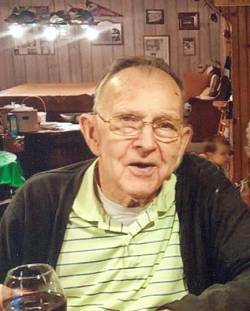 Donald Irwin Cross a longtime area resident passed away at the Northwestern Medical Center on Friday, May 19th, 2017, with his loving family at his side. He was born in Northfield, Vermont on November 18th, 1924, the son of the late John I. and Dorothy L. (Thompson) Cross. Donald was 92 years old. Donald was educated in Northfield and on August 26th, 1949, in St. Albans, he married Isabell R. Richard, who survives him. He retired in 1986 following 41 years of service with the former Central Vermont Railroad. During his retirement, he worked at Burt Paquin Ford as his son, Michael’s sidekick. In his younger years, he was an avid deer hunter, enjoyed ski jumping, horseshoes and a good round of golf. He was a former member of the Vermont Home Guard and St. Albans Lodge 1566, B.P.O.E. and Robert E. Glidden Post #758, Veterans of Foreign Wars. Most of all he loved being with his family and will be remembered for his warm, gentle and loving smile. Survivors include his wife of 67 years, Isabell of St. Albans, their children, John Donald Cross of St. Albans, Michael David Cross and his wife, Suzan, of St. Albans and Candie Ann young and her husband, Steve, of Georgia and grandchildren, Michelle and Ben Patnode, Megan Cross, Eric and Jenna Young and Sara and Stephen Mahieu as well as 8 great-grandchildren. In addition to his parents, Donald was predeceased by his daughter-in-law, Phyliss Cross on November 11th, 2011. At Donald’s request, there will be no services. As an alternative to flowers, his family suggests memorials to the American Cancer Society, Vermont Chapter, 55 Day Lane, Williston, Vermont 05495.